Home / Posts Tagged "Private Michael Lapparth"
History Hub Ulster is asking people living in the Kilkeel area for help to find information on First World War serviceman Christopher Fitzgibbon. It is believed Private Fitzgibbon enlisted in the Connaught Rangers in Dublin around August 1909 and died on 17 August 1914. He is buried in the Ferozepore Military Cemetery in India. Christopher Fitzgibbon is believed to be the first Ulster fatality in World War One serving with an Irish Army Regiment. However research has produced very little information on his life. He is noted to have been born in Kilkeel although no evidence for this has been found. These four casualties were Private Jeremiah Cronin from Cork, Private Christopher Fitzgibbon from Kilkeel, Private Martin Keeley from Galway and Private Michael Lapparth from Mayo. Privates Cronin, Keeley and Lapparth are all remembered on the Kirkee War memorial while Private Fitzgibbon is remembered on the Karachi memorial. This indicates that he was most likely the soldier who died from heat stroke on the train. While we know how Private Fitzgibbon died and where he is buried, his early life remains a mystery as his birth has not been sourced nor was he entered on either the 1901 or 1911 census in Kilkeel. Where did he grow up in Kilkeel? Who were his family? Are his family still in the area? Is he remembered on a war memorial in Kilkeel? Who took receipt of the British War Medal he was awarded? 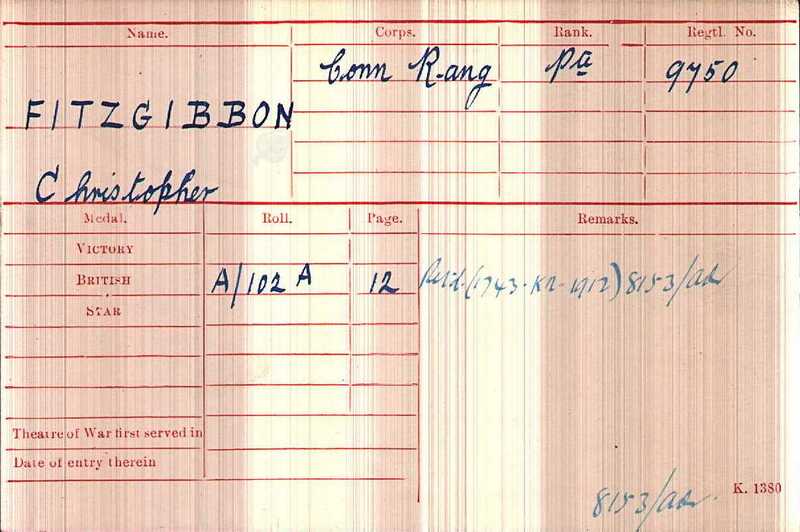 Christopher Fitzgibbon was a Private in the 1st Battalion, Connaught Rangers, service number 9750. 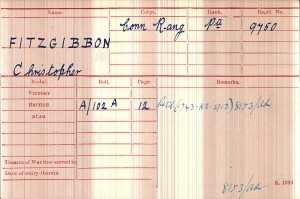 His service number suggests an enlistment date around August 1909. The 1st Battalion of the Connaught Rangers was stationed in India from March 1908. It is likely that Private Fitzgibbon joined the battalion in India between Dec 1909 and March 1910. He was awarded the British War Medal. He died from heatstroke on 17th August 1914 and is buried at FEROZEPORE Cemetary in India.